Well, that’s a complete a total lie – I hate the cold. I blame growing up in California, but I’ve been living on the East Coast for most of the past 7 years so it’s probably my own fault I haven’t adapted. But the cold does give a solid reason for making warming casseroles and stews. At the grocery store this past week I impulsively bought turnips and then had to figure out what to do with them. After looking at a few recipes and debating their merits, I decided on my own personal variation of Shepard’s Pie. For the topping: peel and chop a large potato. Boil in slated water until soft. Mash with 1 tablespoon milk, 1 tablespoon butter, and a pinch of salt. There are potato mashers out there – but you can use a fork. In fact, that’s a good way to see if the potatoes are really done. If they can’t be mashed with a fork, they aren’t done cooking. For the filling: Chop up veggies! The beauty of something like shepard’s pie is you can literally adjust the veggies to whatever you want. 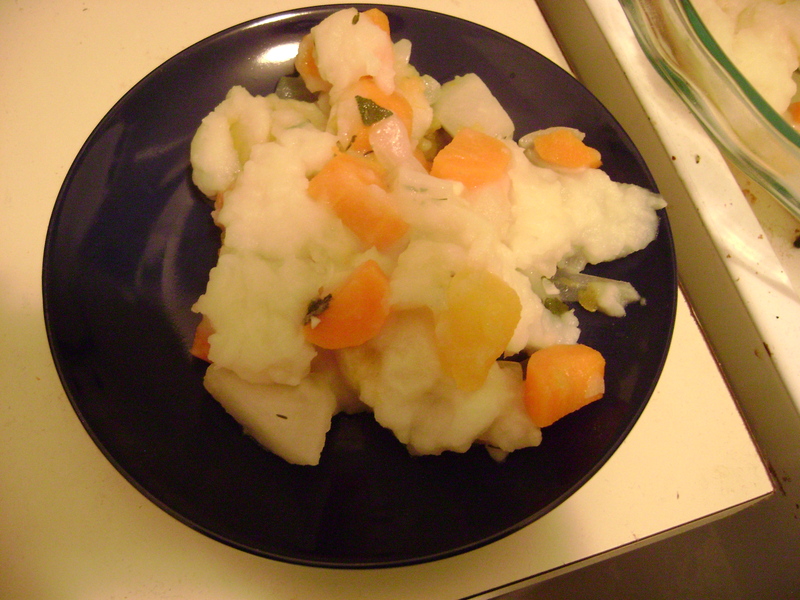 I used carrots, butternut squash, and, of course, turnips. In a large sauce pan (that’s important) saute onion and garlic, when they are about done, add 2 pinches of dried thyme, some chopped sage, and the chopped veggies. Coat the veggies with the mixture, and then add 1 1/2 cups vegetable broth (see told you using a large sauce pan was important). Add a bay leaf, and simmer for 15ish minutes, or until the veggies are tender. Pour off most of the excess liquid (leave a little). Pour the veggies into a pan/casserole dish/pie plate. Top with the mashed potatoes and bake for a while. Either until the potatoes are browning or you get too hungry from them smell and say “damnit – I’m eating it now.” For the record that is exactly what I did. This recipe was delicious. And economical. And makes you feel good about yourself cause its pretty damn healthy. Also – it can very easily be made vegan, if you want. And reheats well for a healthy lunch the next day. But most importantly it was delicious. Sage and thyme make an excellent pair for winter casseroles. I will say though, you should probably wait until the mashed potatoes are a bit browner than I did when you make it. Finally, song obsessions of the week: an amazing version of “Little Drummer Boy” which was one of my least favorite Christmas songs until this version, and “Bohemian like You” by the Dandy Warhols.